Make dip: Puree cilantro with all dip ingredients except yogurt in a blender, stirring down side occasionally, until smooth. Stir puree into yogurt with salt to taste. Spoon into a serving bowl and drizzle with additional olive oil if desired. Make accompaniments: Preheat oven to 375F with racks in upper and lower thirds. Split pitas to make 12 rounds. Stir together butter and 1/4 teaspoon salt, then lightly brush on rough sides of pitas. Cut pitas into 1/2-inch-wide strips and arrange on 2 baking sheets. Bake, switching positions of sheets halfway through baking, until golden and crisp, 8 to 10 minutes. If using broccolini, peel stem using a vegetable peeler. Have a bowl of ice water ready. Cook broccolini or broccoli in a large saucepan of boiling salted water until crisp-tender, about 2 minutes, then transfer to ice water to stop cooking. Drain well. 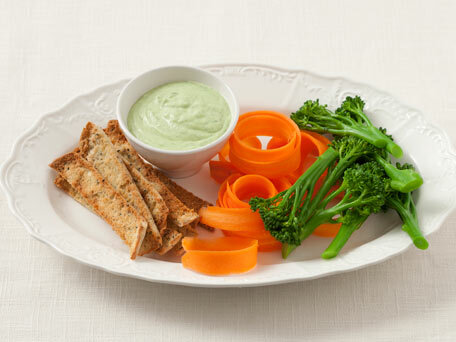 Serve dip with pita strips and vegetables. Make ahead: Pita strips can be made 3 days ahead and kept in an airtight container at room temperature. Dip can be made 1 day ahead and kept chilled. Vegetables can be prepared 1 day ahead. Keep carrot curls in ice water and broccolini or broccoli in damp paper towels in a plastic bag. Just before serving drain carrot curls and discard toothpicks.